from the pages of bluejacket.com. Although corpsmen go back to the very beginning of the Navy, it was 100 years ago, in June 1898 that the Hospital Corps was officially established. In 1814, Navy Regulations mention a "loblolly boy" who was to serve the surgeon and the surgeon's mate. The loblolly boy prepared for battle by filling containers with water to hold amputated limbs. In addition, his duties called for maintaining the braziers of charcoal to heat the tar which was used to stop the hemorrhaging from the amputations. Keeping the deck safe for the surgeon around the operating area was a duty during battle. The deck, slippery with blood, was to be treated with buckets of sand. Sounds gruesome, but cannon balls and cutlasses were not tidy weapons and amputation was the standard treatment for compound fractures. The "surgeon's steward" replaced the loblolly boy. Recognizing the need for additional trained help, surgeons selected promising young men for training in elementary medicine. More than a clean up person, this specialist is probably the true forerunner of today's corpsman. When Congress established the Hospital Corps, the Secretary of the Navy appointed 25 senior "apothecaries" as Pharmacists. These 25 are the charter members of the Hospital Corps. The Naval Hospital Corpsman has served this country well throughout our history. This is one of our nation's treasured memorials to it's heros. One of the Marines represented in this memorial is Hospital Corpsman John Bradley. Doc Bradley died January 11, 1994. 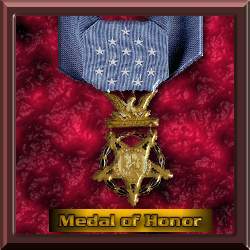 Several Naval Hospital Corpsman have received our Nation's highest honor. Read one story. 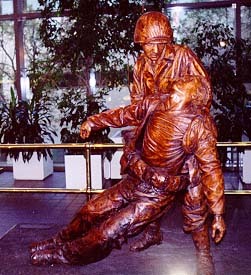 For conspicuous gallantry and intrepidity at the risk of his own life above and beyond the call of duty while serving as Corpsman with Company C, First Battalion, Seventh Marines against elements of a North Vietnam Aggressor (NVA) battalion in Quang Ngai Province Republic of Vietnam on 28 March 1966. Petty Officer Ingram accompanied the point platoon as it aggressively dispatched an outpost of an NVA battalion. The momentum of the attack rolled off a ridge line down a tree covered slope to a small paddy and a village beyond. Suddenly, the village tree line exploded with an intense hail of automatic rifle fire from approximately 100 North Vietnam regulars. In mere moments, the platoon ranks were decimated. oblivious to the danger, Petty Officer Ingram crawled across the bullet spattered terrain to reach a downed Marine. As he administered aid, a bullet went through the palm of his hand. Calls for "CORPSMAN" echoed across the ridge. Bleeding, he edged across the fire swept landscape, collecting ammunition from the dead and administering aid to the wounded. Receiving two more wounds before realizing the third wound was life-threatening, he looked for a way off the face of the ridge, but again he heard the call for corpsman and again, he resolutely answered. Though severely wounded three times, he rendered aid to those incapable until he finally reached the right flank of the platoon. While dressing the head wound of another corpsman, he sustained his fourth bullet wound. From sixteen hundred hours until just prior to sunset, Petty Officer Ingram pushed, pulled, cajoled, and doctored his Marines. Enduring the pain from his many wounds and disregarding the probability of his demise, Petty Officer Ingram's intrepid actions saved many lives that day. By his indomitable fighting spirit, daring initiative, and unfaultering dedications to duty, Petty Officer Ingram reflected great credit upon himself and upheld the highest traditions of the United States Naval Service. Many Naval Hospital Corpsmen throughout our Nations History have given the supreme sacrifice. Here is a site Dedicated to Paul Frank Doronzo HM3. Several Naval Hospital Corpsman are listed as POW/MIA.